« Ludwig Leichhardt – nearly 200 years! Old Balmain: Paddocks and Shipyards. The two biggest paddocks in Balmain, were Pilchers (Grafton Street) and Ory’s (cnr of Elliot and Glassop Streets) Ory’s was thickly covered with bushes and trees and a good playground for the children who loved to climb. housing commission homes are built there today. Shipyards: Many shipyards were seen around the shores of Balmain and some played a very significant role during World War II. they were Mort’s Dock and Engineering, Foole and Steel, Howard Smith, White and Co S.G White, Adelaide Steamship, Chapmans Dock, Jubilee Storey and Keers, Morrison and Sinclair and Sydney Ferries. Balmain’s Maritime History includes the history of boat yards, shipyards and ship repair yards which once inhabited Balmain and provided employment for Painters and Dockers. 4. Nichol Bros. Pty Ltd and Penquin Heavy Lifting Pty Ltd 10-20 Weston Street Balmain East. Nicol Bros Pty Ltd and Penguin Heavy Lifting Pty Ltd, 10-20 Weston Street. 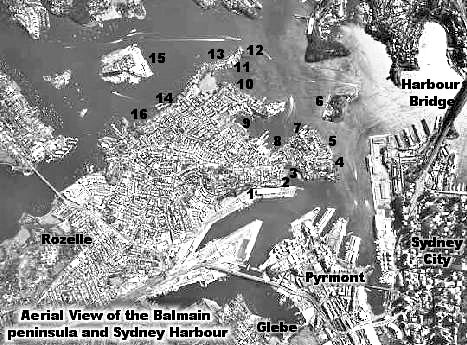 1 comment to Old Balmain: Paddocks and Shipyards. i served my apprenticeship at Jubilee engineering Louisa rd. Long Nose point in the early 70’s. I’m trying to find out information on the company ie: when did they start there, who owned the company, when did it close, did they move to another location etc. Any help you can provide would be much appreciated.